The graph above is taken from Piketty and Saez in their seminal 2003 article in the Quarterly Journal of Economics. It shows that inequality fell during the Great Depression. This is a contention that I have always been very skeptical of for many reasons and which has been – since 2012 – the reason why I view the IRS-data derived measure of inequality through a very skeptical lens (disclaimer: I think that it gives us an idea of inequality but I am not sure how accurate it is). During the Great Depression, unemployment was never below 15% (see Romer here for a comparison prior to 1930 and this image derived from Timothy Hatton’s work). In some years, it was close to 25%. When such a large share of the population is earning near zero in terms of income, it is hard to imagine that inequality did not increase. Secondly, real wages were up during the Depression. Workers who still had a job were not worse off, they were better off. This means that you had a large share of the population who saw income reductions close to 100% and the remaining share saw actual increases in real wages. This would push up inequality no questions asked. This could be offset by a fall in the incomes from profits of the top income shares, but you would need a pretty big drop (which is what Piketty and Saez argue for). There is some research that have tried to focus only on the Great Depression. The first was one rarely cited NBER paper by Horst Mendershausen from 1946 who found modest increases in inequality from 1929 to 1933. The data was largely centered on urban data, but this flaw works in favor of my skepticism as farm incomes (i.e. rural incomes) fell more during the depression than average incomes. There is also evidence, more recent, regarding other countries during the Great Depression. For example, Hungary saw an increase in inequality during the era from 1928 to 1941 with most of the increase in the early 1930s. A similar development was observed in Canada as well (slight increase based on the Veall dataset). Had Piketty and Saez showed an increase in inequality during the Depression, I would have been more willing to accept their series with fewer questions and doubts. However, they do not discuss these points in great details and as such, we should be skeptical. I have recently finished reading Famine and Finance by Tyler Beck Goodspeed. While short, it should have a prominent place on the shelves of economic historians interested (obviously) in Irish history and (less obviously) in Malthusian theory. Famine and Finance is a study of the response of Irish farmers to the potato blight. As it is known to many, many individuals simply left Ireland. However, where micro-credit was available, Goodspeed finds that farmers adapted by shifting to different types of activities – notably livestock. These areas experienced a smaller decline in population. Basically, where the institution of micro-credit was present, the demographic shock was much less severe. If only for this nuance, the book makes a sizeable contribution to the historiography of Ireland. The methods used are also elegantly simple and provide an interesting road map for anyone interested in studying the responses of local population to environmental shocks. However, the deeper point comes from it tells us about institutions. In Goodspeed’s story, the amplitude of the collapse of the Irish population in the 19th century depends on the presence of the institution of micro-credit. Basically, the institution determined the amplitude of the shock. Since Ireland’s potato blight is often presented as the textbook case of Malthusian pressures, Goodspeed’s results are particularly interesting. In his chatper titled”Was Malthus Right?”, he shows that when controls for the institution of micro-credit is present, the typical Malthusian variables fail to explain population changes. In other words (i.e. my words) , Malthusian pressures (the change in population) are in fact institutional failures. This is a point I have often made elsewhere (see here, here and here and a blog post here). And because Goodspeed backs this point of mine, he has earned himself a place on my shelf of “go-to” books. Over the last few years, while I continued my research on other fronts, I started spending small amounts of time on a daily basis to read about the Great Depression and more precisely, how Canada lived through the depression. Since the old adage is that Canada gets pneumonia when the US gets the flu, I thought that it was a worthy endeavor (although Pedro Amaral and James McGee have been working on that front) to try to see what insights we can derive from looking at Canada’s experience during the Great Depression (especially since it had a very different banking system). In the process, I managed to collect in a datasheet, the Industrial Production Index of Canada (consisting largely of heavy industry with some light industries and utilities, making it a relatively well-rounded index). This is what it looks like. Other than seeing Canada’s experienced mirrored in the US experience (except for the 1935-1937 window), I am not sure what to make of it. However, I thought it worthwhile to share that information publicly. Over the years, I became increasingly skeptical of using tax data to measure inequality. I do not believe that there is no value in computing inequality with those sources (especially after the 1960s, the quality is much better in the case of the US). I simply believe that there is a great need for prudence in not overstretching the results. This is not the first time I make this point (see my paper with Phil Schlosser and John Moore here) and I think it is especially crucial for anything prior to 1943 (the introduction of tax withholding). One of my main point is that the work of Gene Smiley which ended up published in the Journal of Economic History has generally been ignored. Smiley had highlighted many failings in the way the tax data was computed for measuring inequality. His most important point was that tax avoidance foiled the measurements of top incomes and how well they could transposed on the overall national accounts. More precisely, Smiley argued that the tax shelters of the 1920s and 1930s would have affected reporting behavior. As long as corporations could issue stock dividends rather than cash dividends, delaying the payment of dividends until shareholders were in lower tax brackets, there would be avoidance. Furthermore, state and municipal securities were exempted from taxation which meant that taxpayers could shelter income and end up in lower brackets. All this combined to wide fluctuations in marginal tax rates conspires to reduce the quality of the tax data in computing inequality. Rather than substantial increases in inequality, Smiley found that his corrected estimates (which kept tax rates constant) suggested no increase in inequality during the 1920s and a minimal decrease when you exclude capital gains. Alongside John Moore, Phil Schlosser and Phil Magness, I am in the process of attempting to extend the Smiley corrections to include everything up to 1941 (Smiley had ended in 1929). As a result, I had to assemble the tax data and the tax rates and I was surprised to see that, even without regressions, we can see the problem of relying on the tax data for the interwar period. The number of millionaires in the tax reports is displayed below. As one can see, it is very low from 1917 to 1924 – a period of high tax rates. However, as tax rates fell in the 1920s, the number of millionaires quintupled. And then, when the Depression started in synchronicity with the increases in top marginal tax rates, it went back down. It went down by 89% from 1929 to 1941. Now, I am quite willing to entertain that many millionaires were wiped out during the Great Depression. I am not willing to entertain the idea that 9 out of every 10 millionaires disappeared. What I am willing to entertain is that the tax data is clearly and heavily problematic for the pre-withholding era. * This is evidence in favor of caution and prudence in interpreting inequality measures derived from tax data. * I am of those who believe that inequality was lower than reported elsewhere in the 1920s, higher than reported in the 1930s and 1940s. Combined together, these would mean that inequality would tend to follow a L-curve or a J-curve from the 1920s up to the present rather than the U-curve often reported. I will post more on this as my paper with Moore, Schlosser and Magness progresses. In a recent article for the Freeman, Steve Horwitz (who has the great misfortune of being my co-author) argued that stock markets tell us very little about trends in economic growth. Stock markets tell us a lot about profits, but profits of firms on the stock market may be higher because of cronyism. Basically, that is Steve’s argument. He applies this argument in order to respond to those who say that a soaring stock market is the proof that Donald Trump is “good” for the economy. I know Steve’s article was published roughly a month ago, so I am a little late. But I tend to believe it is never too late to talk about economic history. And basically, its worth pointing out that there are economic history examples to show Steve’s point. In fact, its the best example: Smoot-Hawley. 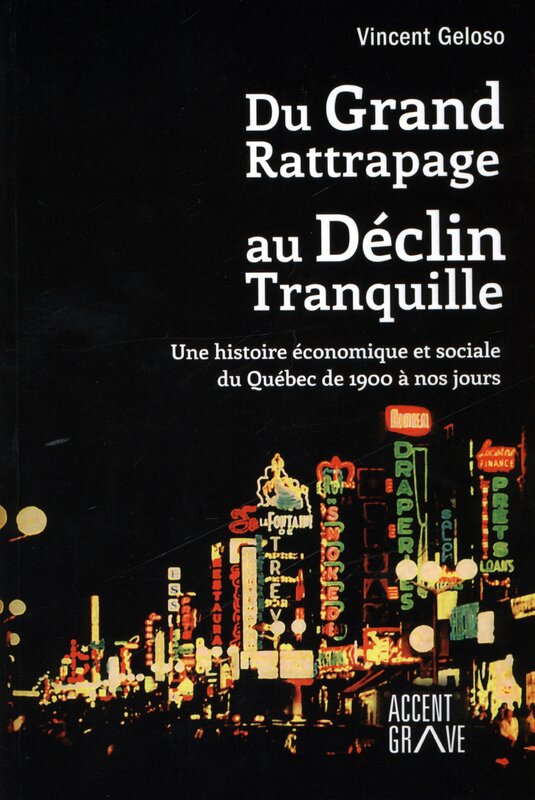 Bernard Beaudreau from Laval University has advanced, for some years, an underconsumptionist view of the Great Depression (I consider it a “dead theory”). 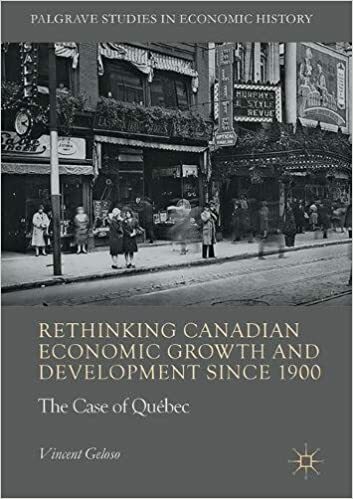 While I am highly unconvinced by this theory (in both its original and current “post-keynesian” reformulation), Beaudreau tries hard to resurrect the theory (see here and here) and merits to be discussed. In the process, Beaudreau attempted to reestimated the effects of of Smoot-Hawley on the stock market with an events study. Unconvinced about the rest of his research, this is a clear instance of sorting the wheat from the chaff. In this case, the wheat is his work (see here for his article in Essays in Economic and Business History) on Smoot-Hawley. Basically, Beaudreau found that good news regarding the probability of the adoption of the tariff bill actually pushed the stock market to appreciate. Thus, Smoot-Hawley -which had so many negative macroeconomic ramifications* – actually boosted the stock market. Firms that gained from the rising tariffs actually saw greater profits for themselves and thus the firms on the stock market would have been excited at the prospect of restricting their competitors. If that is true, could it be that Donald Trump is the modern equivalent (for the stock market) of Smoot-Hawley. *NDLR: I believe that Allan Meltzer was right in saying that the Smoot-Hawley might have had monetary ramifications that contributed to the money supply collapse. It was a real shock that precipitated the collapse of weak banks which then caused a nominal shock and then the sh*t hit the proverbial fan. Continuando um post antigo, seguem mais alguns mitos, equívocos e objeções comuns ao capitalismo. Mito #1: Herbert Hoover praticava o laissez-faire, e foi sua falta de ação que levou ao colapso econômico. Na verdade Herbert Hoover era tremendamente intervencionista na economia. Sua intervenção cooperou para o início da depressão e sua continuada intervenção evitou que a economia se recuperasse logo. Mito #2: o New Deal trouxe fim à Grande Depressão. Longe de ser uma série de medidas coerentes contra a depressão, o New Deal foi uma tentativa de Frank Delano Roosevelt de demonstrar que estava fazendo alguma coisa. As medidas do New Deal apenas agravaram e prolongaram a crise. Países que adotaram uma postura menos intervencionista se recuperaram da crise mais rápido do que os EUA. Mito #3: A Segunda Guerra Mundial deu fim à Grande Depressão. Talvez este seja o pior mito de todos: a produção industrial no contexto da Segunda Guerra gerou empregos, aumentou o PIB, e com isso acabou com a Depressão. Conforme Friedrich Hayek afirmou, “da última vez que chequei, guerras apenas destroem”. Este mito é uma aplicação da falácia da janela quebrada, observada por Frédéric Bastiat. Guerras não produzem riqueza. Na verdade elas a destroem. O exame cuidadoso dos dados históricos demonstra que a economia dos EUA só se recuperou realmente quando a Segunda Guerra Mundial já havia acabado. Considerando o capitalismo economia de livre mercado, onde indivíduos são livres para escolher, nada poderia estar mais longe da verdade. O capitalismo assim definido é cego para raça ou gênero. O que importa é a troca de valores. Para ficar em apenas um exemplo, as lideranças políticas do sul dos EUA pressionavam os donos de empresas de ônibus a segregar os passageiros com base na cor da pele. Os próprios empresários de ônibus queriam ganhar dinheiro com transporte de pessoas, independente da cor da pele. Apenas uma observação: recusar serviço com base em cor de pele, gênero, orientação sexual ou qualquer outro motivo é uma prerrogativa do indivíduo dentro do capitalismo. Leve seu dinheiro para uma instituição que o receba. A instituição que recusa serviço está perdendo dinheiro, e neste sentido já recebeu a punição dentro do capitalismo. Esta é uma observação presente tanto em Marx quanto em Keynes. Conforme observado nos mitos sobre a Grande Depressão e o New Deal, exatamente o oposto é verdade. Conforme a Escola Austríaca em geral e Friedrich Hayek de forma especial observaram, é a intervenção do governo, particularmente no setor bancário e financeiro, que produz bolhas e pânico. A tentativa do governo de estimular a economia através de juros baixos e outros artifícios apenas cria ciclos de crescimento e queda. Milton Friedman e a Escola de Chicago fizeram observações semelhantes. Deixada livre a economia é de certa forma imprevisível, mas através do sistema de preços podemos nos guiar sobre quando e no que é melhor gastar. É difícil saber o que seria um investimento importante. Somente indivíduos podem avaliar o que é importante para eles mesmos. O raciocínio aqui é que há investimentos de longo prazo, que custam muito dinheiro e não produzem resultado imediato. Capitalistas não investiriam em voos espaciais ou na cura de doenças, por exemplo. Mais uma vez observa-se a falácia da janela quebrada: investir em uma coisa significa não investir na próxima melhor opção. Exemplos recentes mostram que empresas atuando no livre mercado podem fazer mais, melhor e com menos desperdício do que governos, inclusive quando o assunto é exploração espacial. Mais uma vez este é um argumento de orientação subjetiva. Aquilo que é duvidoso para um individuo pode ser bom para outro. Há aqui a velha máxima de que “o capitalismo produz necessidades artificiais”. Conforme Voltaire respondeu a Rousseau mais de 200 anos atrás, este argumento não se sustenta. O que é uma “necessidade artificial”? Tesouras são necessidades artificiais? E sabão? E pasta de dente? Porque seres humanos viveram por séculos sem estas coisas. Conforme já foi observado por Joseph Schumpeter, a grande virtude do capitalismo é justamente trazer conforto a baixo preço não para reis e rainhas, mas para as pessoas mais simples em uma sociedade. Ainda que alguns possam considerar certos produtos de consumo duvidosos. Apenas não comprem. A few weeks ago, I finished reading Scott Sumner’s The Midas Paradox. As an economic historian, I must say that this is by far the best book on the Great Depression since the Monetary History of the United States. Moreover, it is the first book that I’ve read that argues simply that the Great Depression was the result of a sea of poor (and sometimes good) policy decisions. However, coming out of the book, there was one thing that came to mind: Sumner is underselling his (very strong) case. In essence, the argument of Sumner looks considerably like that of Milton Friedman and Anna Schwartz: The Federal Reserve allowed the money supply to contract dramatically up to 1932, turning what would have been a mild recession into a depression. However, Sumner adds a twist to this. He mentions that after the depth of the monetary contraction had been reached, there was a reflation allowing an important recovery during 1933. This is standard AS-AD macro of a (very late) expansionary policy to allow demand to return to equilibrium. Normally, that would have been sufficient to allow the rebound. Basically, this is the best case for NGDP targeting: never let nominal expenditures fall below a certain path because of a fall in demand. The problem, according to Sumner, is that the recovery was thwarted by poor supply-side policies (like the National Industrial Recovery Act, the Agricultural Adjustment Act etc.). The positive effects of the policy were overshadowed by poor policy. And thus, the depression continued. To be fair, Sumner is not the first to emphasize the “real” variables side of the Great Depression. I am especially fond of the work of Richard Vedder and Lowell Galloway, Out of Work, which is a very strong candidate for being the first econometric assessment of the effects of poor supply-side policies during the Great Depression. I was also disappointed (but not too much since Sumner did not need to make this case) to see that no mention was made of the Smoot-Hawley tariff as a channel for monetary transmission (as Allan Meltzer argued back in 1976) of the contraction. Nonetheless, Sumner is the first to bring this case so cogently as a story of the Great Depression. Thus, these small issues do not affect the overall potency of his argument. The problem, as I mentioned earlier, is that Sumner is underselling his case! I base this belief on the experience of England at the same time. Unlike the United States, the British decided to apply their piss-poor supply-side policies during the 1920s – well before the depression. The seminal paper (see this one too) on this is by Stephen Broadberry (note: I am very biased in favor of Broadberry given that he is my doctoral supervisor) who argued that the supply shocks of the 1920s caused substantial drops in hours worked and although the rise of unemployment benefits played a minor role, the vast majority of the causes were due to the legal encouragement of cartel formation. As a result, there were no supply-side shocks during the depression to create noise. However, England did have a demand-side expansionary policy in 1931. Even if it was by accident more than by design, England left the gold standard in September 1931. This led to the equivalent of an easy monetary policy and the British economy stopped digging and expanded afterwards. The Great Depression was not a pleasant experience for the British, but it was not even close to the dreadful situation in the United States. As a result, we can see whether or not it was possible to exit the Great Depression by virtue of a monetary policy. I’ve combined the FRED dataset on monthly industrial production and the monthly GDP estimates for inter-war Britain produced by Mitchell, Solomou and Weale (see here) to see what happened in England after it left the gold standard. As one can see, the economy of Britain rebounded much more magnificently than that of the United States in spite of supply-side constraints. Sumner should expand on this point! To be fair, he does talk about it briefly. Not enough! A longer discussion of the British case provides him with the “extra mile” to cover the distance against competing theories. The absence of supply shocks in Britain during the Depression confirm his story that the woes of the United States during the 1930s are due to initially poor monetary policy and then poor supply-side policies. In my eyes, this is a strong confirmation of the importance of the NGDP level target argument! With such a point made, it is easy to imagine a reasonable counterfactual scenario of what economic growth would have been after monetary easing in 1933 in the absence of supply-side shocks. 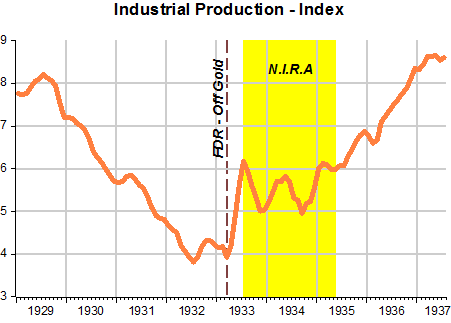 Had the United States kept very unregulated labor and product markets, it is quite reasonable to believe (given the surge seen in 1933 in the Industrial Production data) that the United States would have returned to 1929 levels. In the absence of such a prolonged economic crisis, it is hard to imagine how different the 1930s and 1940s would have been but it is hard to argue that things would have been worse. UPDATE: From the blog Historinhas, Marcus Nunes sent me the graph below confirming the importance of the NIRA shock on eliminating all the benefit from easy money after 1933.